Could Carrizo Oil & Gas Be a Takeover Target? Carrizo's market cap is just $2.67 billion, only slightly larger than Rosetta Resource's, which was bought by Noble Energy. This means Carrizo is an inexpensive acquisition target. NEW YORK (Real Money) -- News of the acquisition of oil driller Rosetta Resources (ROSE - Get Report) by Noble Energy (NBL - Get Report) caused the former to rise by over 27% Monday. The deal should close during the third quarter, and will net shareholders 0.542 shares of Noble for each unit of Rosetta. Despite the pop in Rosetta, it's still more than 50% below last year's closing high of $54.85. This is as much a reflection of the state of the shale oil industry as it is on the company. Rosetta's business is focused in Eagle Ford and the Permian Basin, two shale hot spots that have seen sharp declines in production due to crude oil's recent selloff. With so many drillers from those areas now fallen on hard times, could the Rosetta deal spark a series of similar transactions? One name that may find itself in play is Carrizo Oil & Gas (CRZO - Get Report), which also has operations in Eagle Ford. Carrizo's market cap is just $2.67 billion, only slightly larger than Rosetta's, making it an inexpensive acquisition target. One look at its chart tells us Carrizo isn't your typical driller. This stock is an anomaly in the energy sector, having climbed nearly 25% for the year to date. Carrizo's chart remains bullish, as the stock is currently forming a bull channel (black lines). 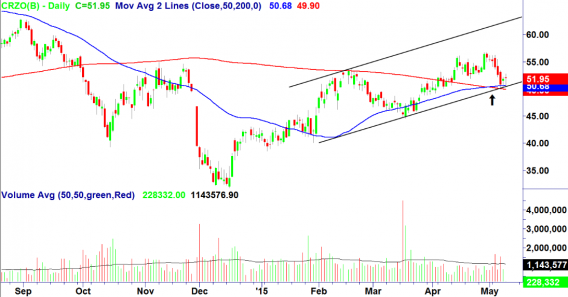 The stock is now at the lower end of that channel, creating a potential buying opportunity. Carrizo is one of the few names in this sector that is showing signs of upward momentum. This is evidenced by the stock's 50-day Moving Average (blue) crossing above its 200-day moving average (red) earlier this month (arrow). The stock is currently trading above both key averages. Not all of this company's fundamental metrics are attractive, but Carrizo's enterprise to Ebitda ratio (earnings before interest, taxes, depreciation, and amortization) is an eye-catching 5.37. This is particularly interesting in light of Rosetta's takeout, since enterprise to Ebitda ratio is a metric that is often cited by takeover specialists. A takeover of Carrizo would give the acquirer significant exposure to Eagle Ford, where the company possesses 82,000 acres. In addition, the acquirer would gain access to the company's operations in Utica and Marcellus. One potential hurdle could present itself in the form of several joint ventures the company has entered into in Eagle Ford, but this is by no means a deal breaker. Carrizo could become a target of a big player seeking quality assets, so I am initiating a small position. Editor's Note: This article was originally published at 11:45 a.m. EDT on Real Money Pro on May 12. This article is commentary by an independent contributor. At the time of publication, the author was long CRZO.